Muscle car fans owe a debt of gratitude to Pontiac. In 1964 Pontiac released the GTO, which started the whole muscle car frenzy. For many years thereafter Pontiac made sure it had a good selection of muscle cars among its product lineup for its demanding customers. In the 1970s when automakers were abandoning performance cars, Pontiac held tough and refused to budge to the new market trends of the Disco Era. 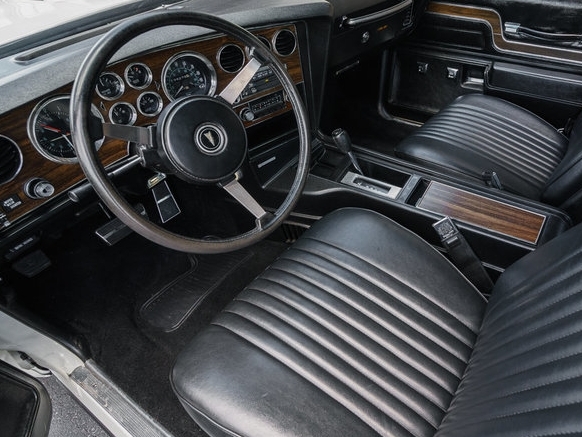 By the mid-1970s Pontiac’s engines were low compression and littered with horsepower robbing pollution-control devices, however Pontiac still managed to please its fans with enough large displacement performance to spin the rear wheels. The signs of the times demanded that even Pontiac had to make compromises. By the early-1970s it became apparent that Pontiac could not have two top performance cars – the GTO and Trans Am. Something had to give. By 1973 Pontiac had made its decision. Only Trans Am and the Firebird Firebird were available with its hottest motor, the Super Duty (SD) 455 cubic-inch V8 initially factory rated at 310 horsepower, in the Trans Am and Firebird Formula only. The 1973 GTO was stuck with the lower output 250 horsepower D-port 455 CID V8 as its top engine option. On the surface it looked like the GTO would last for many years to come. After all, 250 horsepower still kept the GTO at the top of its field. However, Pontiac, by withholding the SD 455, was already signaling the end for the GTO. The next year a 200 horsepower Pontiac 350 cubic-inch V8 was the only GTO engine option available. This was also the year that the GTO nameplate moved to the smaller X-body Ventura. GTO production would end when the 1974 model year ended. For 1975 the only game in town for the performance-oriented Pontiac buyer was the Trans Am. The Grand Prix, once an upscale performance car turned into a plush boulevard cruiser, and all the other Pontiacs became family friendly. Trans Am sales along with Firebird sales skyrocketed by the mid-1970s progressed. Pontiac must have had a guilty conscience by this time, or it received a lot of angry letters from GTO fans. 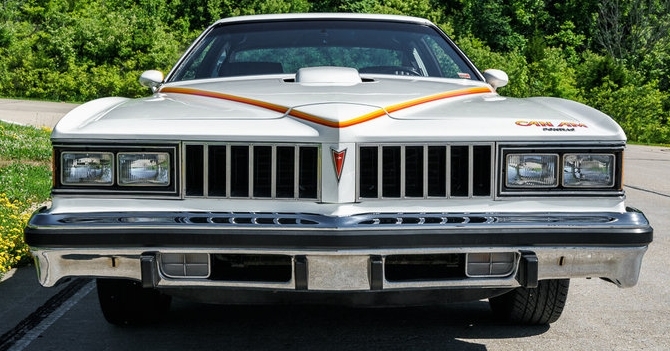 Who really knows what the reasoning was, but Pontiac suddenly resurrected the GTO for 1977. Pontiac released a special limited edition 2-door A-body with some real performance kick. This was a big move for Pontiac since the 1973 GTO was the last A-body GTO. However the return was a stealth move due to the usage of a new name for this car. Pontiac being Pontiac named this new car after what? A racing circuit of course; and the 1977 Pontiac Can Am was born. Though the name did not have the nostalgia of the GTO, it did have a nice ring to it, not to mention it fit well with Pontiac’s performance reputation. GM’s A-body had gained some weight over the years and by 1977 it was at its heaviest. A loaded Pontiac A-body in 1977 tipped the scales at around 4,000 lbs. 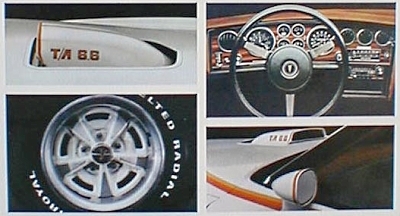 The 1973-1977 A-bodies had GM’s Colonnade body style. The Colonnade styling especially on the 2-door Pontiac LeMans was very attractive and sporty. The 1973 GTO used the Colonnade body style and was overall an attractive car. For the Pontiac LeMans the Colonnade styling got progressively more attractive each new model year, by 1977 Pontiac had perfected the styling. This was the perfect platform for the Can Am. The Can Am had a long hood and an appealing fastback roofline. Though the Cam Am had a conservative looking front grille along with traditional chrome front and rear bumpers, the car did have a very modern look. The Can Am was built on the athletic 2-door LeMans Sport platform. The louvered side rear windows and rear ducktail style spoiler helped to give the Can Am a real tough appearance. Pontiac could have stopped there and nobody would have ever accused the Can Am of not looking the part. However Pontiac added the big (1970–1976 style) Trans Am shaker hood scoop as standard which solidified the muscle car look of the Can Am. Unfortunately it was not functional (there was no cold air passing through it). Two wild stripes colored in different shades of orange started at the Can Am’s beak and crossed the hood in divergent directions spanning the side doors. There were also stripes on the dual sport mirrors and rear spoiler. “Can Am” decals that had the same color scheme as the hood stripes, could also be found on the exterior. And just like the 1969 Trans Am, the Can Am could be ordered in any color as long as it was Cameo White. 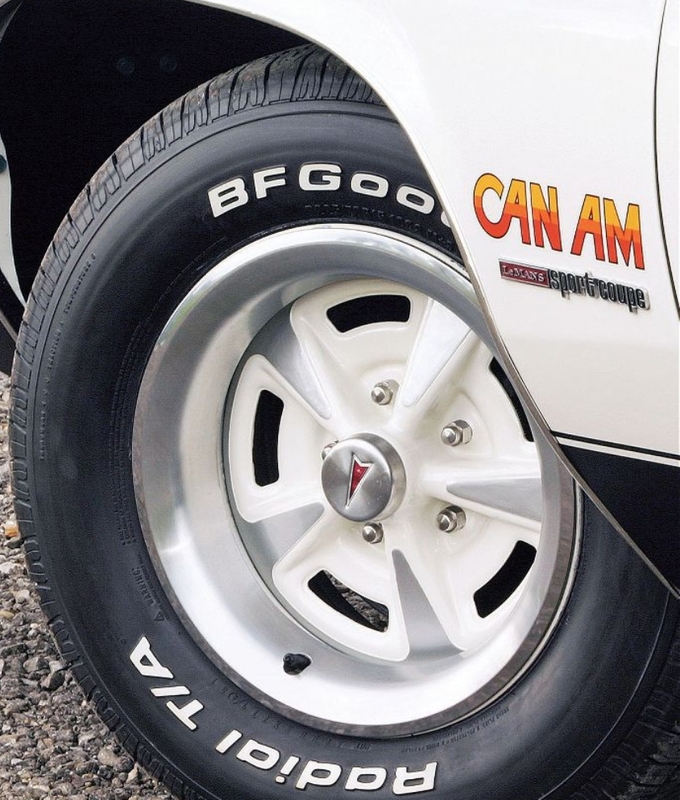 The icing on the cake was a set of mandatory 15×7” Cameo White colored Rally II wheels with trim rings. The Can Am unlike a lot of pseudo muscle cars at the time was a lot more than a decal and appearance package. It was a true muscle car. 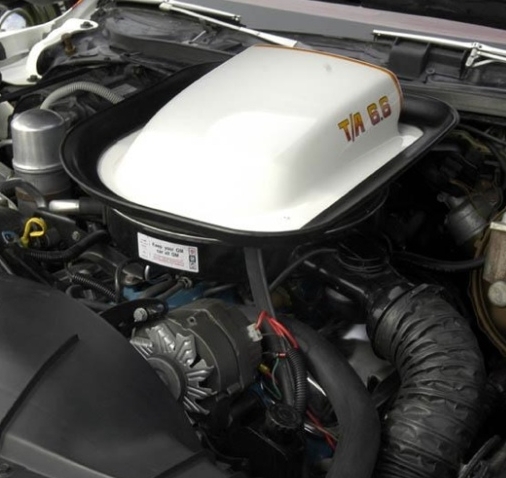 Beating under the hood was the heart of a lion; it was essentially the same D-port 400 cubic-inch V8 block Pontiac first rolled out in the GTO and other Pontiacs for the 1967 model year. The difference was the Can Am’s 400 was a high-output, low compression V8 (instead of high compression) with a gangling of pollution control devices leaching power off the motor. With that being said, the W72 400 under the Can Am’s hood was the same hot top-of-line motor pulled right out of the 1977 Trans Am. The W72 400 was the hottest new American V8 motor back in the late-1970s. The 200 net horsepower figure that Pontiac gave it was well under its true output. NHRA realized Pontiac’s mistake (wink) and rated the stock 1977–1979 W72 400 at 260 net horsepower. Mid to high-15 second 1/4 mile times can be expected for the heavy Can Am – which back in 1977 was quite impressive. Due to the W72 400 not meeting the newly tightened California emissions standards, the Can Am was sold with the 185 horsepower (L80) Oldsmobile 403 CID V8 in the Golden State. Though it was not the perfect substitute for the W72, it did however make globs of low end torque (the same 320 lbs/ft that the W72 produced) which easily propelled the Can Am battlecruiser around town with ease. However what was missing was a manual transmission option. The only transmission available on the Can Am (for both the W72 and L80) was a sturdy Turbo-Hydramatic 350 3-speed automatic. Handling was also very impressive for such a big heavy car due to it having (like the Trans Am) Pontiac’s Rally Tuned Suspension (RTS). Braking was good with its power braking system that consisted of front disc and rear drum brakes. Since the Can Am was based on the LeMans, Pontiac could have taken the easy route and left the interior alone. However they decided instead to spruce it up by offering a state-of-the-art looking dash layout which was taken right out of the 1977 Grand Prix. The seats were comfortable and the buyer had four color choices – black, white, red, and saddle tan to choose from. The only options a savvy buyer needed in order to make his or her Can Am look the part inside the interior was the optional tach, optional automatic transmission console shifter which came with an attractive center console (a column automatic shifter was standard), and the sport steering wheel (which is easy to spot by its oversized hub). Jim Wangers, the Pontiac media guru behind the original 1964 GTO ad campaign, was heavily involved in the Can Am project, so it really came as no surprise that the main advertising slogan for the Can Am was “Remember the Goat.” Wanger’s company, Motortown Corporation, was responsible for the production and installation of the rear spoiler, the application of decals, and the modifying of the hood for the shaker hood scoop. Everything seemed to be falling in Pontiac’s favor and the Can Am appeared destined for success. Then Murphy’s Law struck. The mold used to produce the Can Am’s rear spoiler was damaged beyond repair during Can Am production. This was enough to put an end to the Can Am’s production run. Pontiac pulled the plug, freezing the total production of the Can Am at 1,133 units – which was well below the 5,000 target. There’s an interesting little twist in this story. 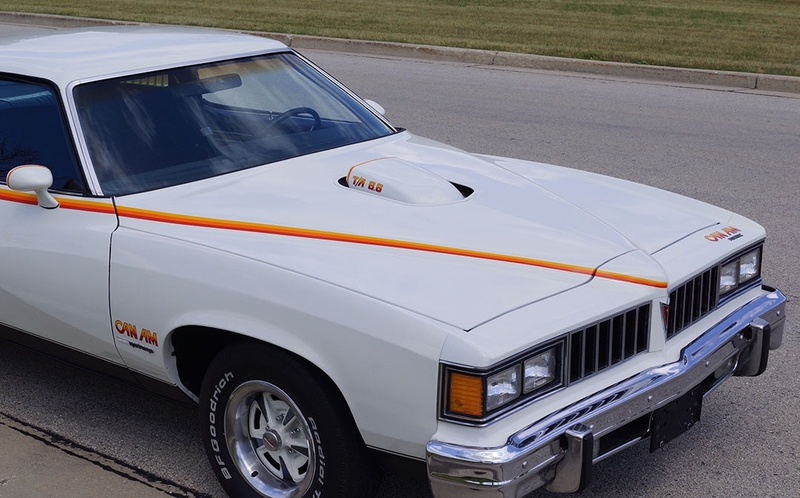 When Pontiac pulled the plug on the Can Am it had a whole slew of Cameo White LeMans Sport Coupes that were waiting to be sent to Motortown for Can Am conversion. Pontiac did not scrap these cars, it just sent them to Pontiac dealers as LeMans Sports Coupes without decals, without rear spoilers, and without shaker hood scoops. The question is, how many of these special LeMans most of which were equipped with the W72 400 engine (not an option on any 1977 LeMans) made it to Pontiac dealers? Nobody really knows. It makes you wonder how many people bought these special LeMans Sport Coupes clueless to the rarity of their cars. The cost of the Can Am option was $1,214 over the price of a LeMans which put the total sticker price well over $5,000. That may have seemed like a lot back in 1977 to some LeMans buyers, however it was a bargain when compared to a W72 400 powered 1977 Trans Am. The Can Am provided a lot of bang for the buck. The tragedy is that one broken mold made what would have been a successful project a failed venture. It is unknown whether Motortown was short on funds or just lacking in sense in not having a backup mold when production of the Can Am started. Another tragedy is that if the Can Am had a successful run of 5,000 units in 1977 as was expected, there may have been a return of a W72 powered Can Am for 1978 in the new downsized (which was 600 lbs lighter than the 1977 Can Am) 1978 LeMans platform (which would have easily sailed into 14-second quarter mile range. However it was never meant to be. The positive is that enough Can Ams were produced to make it into the hands of over a thousand lucky owners. These owners knew that 1977 was the return of the GTO. It proved that Pontiac could still provide the performance and the entire muscle car package that went with it. Unfortunately this was the last hurrah. Pontiac a few years later would be forced to use Chevrolet small-block V8s in its sporty rear-wheel drive cars. The styling may have been there for these post-1981 Pontiacs but some of that old Pontiac flair was gone. A high-performance 2004-2006 GTO would return but it was merely a fast car with no real connection to the original GTO. Indeed, the 1977 Can Am was the last GTO.